Catholic News World : #BreakingNews Grandmother Robbed coming from Church repeats "Jesus, mother Mary, help me, I'm not afraid because you're with me." #BreakingNews Grandmother Robbed coming from Church repeats "Jesus, mother Mary, help me, I'm not afraid because you're with me." 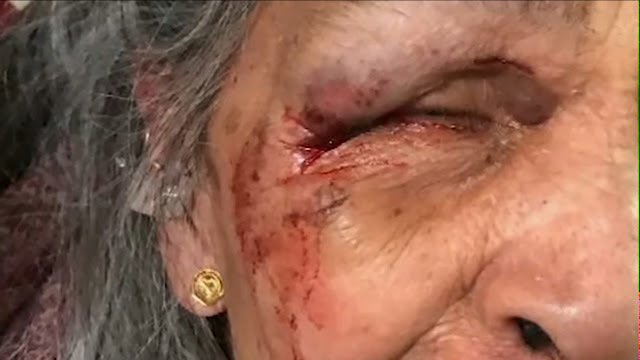 A Grandmother, aged 87, from Jersey City was viciously beaten, and robbed as she returned home from Church. "Jesus, mother Mary, help me, I'm not afraid because you're with me." Police are still searching for the suspects who left her bloodied with a swollen eye, police said. Ana Lagundi, a mother of six and grandmother of 10, described how the men covered her mouth and punched her in the face, knocking her to the ground. Lagundi said she had less than $20 in the purse the men snatched from her. Surveillance video captured the suspects running through an alley. But church or home, her faith remains rock strong and she continues to pray, including, remarkably, for the men who hurt her, she said. "I only pray they will find them so they will reform," she said. "I forgive them. Even they did what they did. I thank God I am alive."